At St Joseph’s our aim is to provide the best possible education for all children. As a parent you know your child best and it is our wish to work in partnership with you to ensure that your child achieves their full potential. Who are the best people to talk to about my child’s difficulties with learning, special educational needs or disability? In the first instance, it is always best to talk to your child’s class teacher about your concerns. It is likely that the class teacher will have discussed your concerns with Mrs Shah the school Special Educational Needs Coordinator (SENCo). In the first instance you may want to arrange a meeting with them. If you continue to have concerns arrange to discuss these with Mrs Wyatt, the Head teacher. How will the school consider my views and those of my child with regard to her/his difficulties with learning, special educational needs or disabilities? At St Joseph’s we believe it is very important for parents/carers to be involved in all areas of their child’s learning and we actively encourage discussions. We believe, where appropriate, that it is essential to understand your child’s views on any difficulties they may experience with their learning. If your child has an identified special educational need you will be invited to a termly meeting with the class teacher and SENCo to discuss current progress, support strategies being used and expected outcomes. The SENCo and other professional may be involved in some of these meetings. You will be able to share your views and discuss your child’s progress during these meetings, and your child’s views will also be sought prior to the meeting and shared with you. If your child has a Statement of special educational need or an Education, Health and Care plan (EHCP) you and your child will be able to share your views at the Annual Review. How does St Joseph’s school ensure the teaching staff are appropriately trained to support my child’s special educational needs and/or disability? At St Joseph’s we believe that your child’s learning needs will first be met through the high quality teaching delivered by her/his class teacher. The school is able to access training programmes from different organisations including the Triborough Training and Outreach team based at QE2 School. St Joseph’s school regularly reviews its Accessibility Plan to ensure that all children have the fullest access to the curriculum and the school site as possible. At St Joseph’s we have a 3 tiered approach to supporting a child’s learning. The school may need to prioritise referrals to these services. For a very small number of pupils access to these specialists may be through a Statement of SEN or an EHC Plan. The purpose of an Education, Health and Care (EHC) Plan, is to make special education provision to meet the special educational needs of a child, to secure improved outcomes for him/her across education, health and social care and, as he/her gets older, prepare for adulthood. You or your school, usually the SENCo or Headteacher, can request the Local Authority to conduct an assessment of your child’s needs which may result in such a plan. specify the provision required and how education, health and social care will work together to meet your child’s needs and support the achievement of the agreed outcomes. St Joseph’s receives funding from the Education Funding Agency and/or the local authority. These funds include money to support the learning of children with SEN and/or disabilities. The Head teacher, in consultation with the school Governors, allocates the budget for SEN provision on the basis of the needs of the children in the school. The Head teacher , Senior Leadership Team and the SENCo discuss the effectiveness of the school’s current interventions and provisions and prioritise an action plan, which may include additional or alternative interventions, staff training and equipment needs. What support will there be for my child’s happiness and well-being at St Joseph’s school? At St Joseph’s we believe that the happiness and well being of all our pupils is paramount. All members of staff take this aspect of school life very seriously. You can be confident that in particular your child’s class teacher, the SENCo, the Learning Mentor and the teaching assistants, are available to provide support to match your child’s needs. St Joseph’s is an inclusive school and committed to providing equal opportunities for all children. 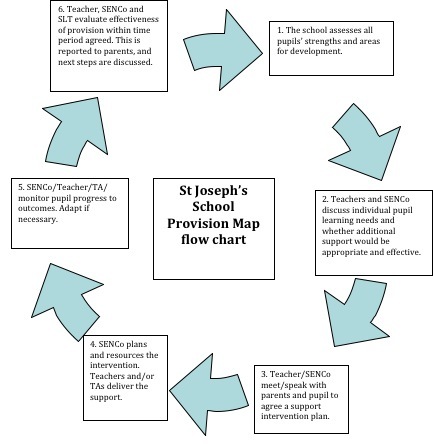 How will St Joseph’s support my child in transition stages? We liaise closely with the school or nursery your child is transferring from. We are able to discuss with the relevant teachers any individual needs and how best to support your child in school. While at St Joseph’s we take care to ensure that during transition points (between classes each year and at the end of Key Stages) all staff are aware of individual pupils needs, learning progress and best support strategies. St Joseph’s makes arrangements to ensure there is a smooth transition when your child transfers to his/her secondary school of choice. Please contact us for further details. Initially speak to your child’s classteacher and/SENCo. Hopefully they will be able to address your concerns and resolve them satisfactorily. If you are not satisfied with the outcome, you should contact the Headteacher to discuss this further. If the matter remains unresolved the Headteacher may direct you to the school’s complaints procedure to the school’s Complaints policy. If I have any other questions about my child at St Joseph’s, who can I ask?